The trademark of an empath is that they feel and absorb other people's emotions and/or physical symptoms because of their high sensitivities. They filter the world through their intuition and have a difficult time intellectualizing their feelings. But an empath doesn't have to feel too much and be overloaded once they learn how to center themselves. The first step is to acknowledge that you are an empath. 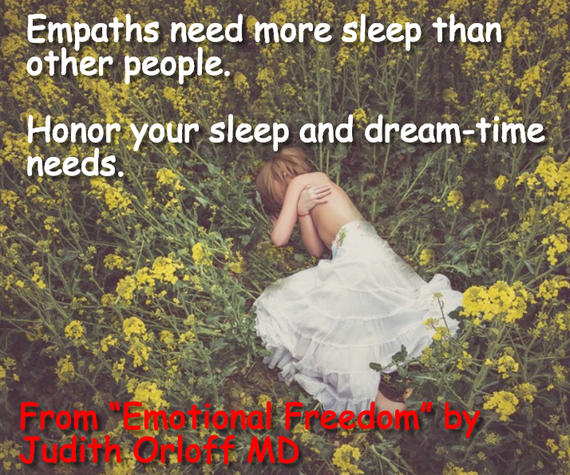 Here are the top 10 traits of an empath from my book on how to achieve emotional freedom. See if you can relate to them. Empaths are naturally giving, spiritually open, and good listeners. If you want heart, empaths have got it. Through thick and thin, they're there for you, world-class nurturers. But they can easily have their feelings hurt. Empaths are often told that they are "too sensitive" and need to toughen up. Empaths are highly attuned to other people's moods, good and bad. They feel everything, sometimes to an extreme. They take on negativity such as anger or anxiety which is exhausting. If they are around peace and love, their bodies take these on and flourish. Empaths experience the world through their intuition. It is important for them to develop their intuition and listen to their gut feelings about people. This will help empaths find positive relationships and avoid energy vampires. Read Introduction to Intuition to learn more. An empath's sensitivity makes them particularly easy marks for energy vampires, whose fear or rage can sap their energy and peace of mind. Vampires do more than drain an empath's physical energy. The especially dangerous ones such as narcissists (they lack empathy and are only concerned with themselves) can make them believe they're unworthy and unlovable. Other vampires include The Victim, The Chronic Talker, The Drama Queen and more. To help you deal with the drainers in your life read 4 Strategies to Survive Emotional Vampires. An empath's nerves can get frayed by noise, smells, or excessive talking. As an empath myself, I use many strategies to protect my sensitivities such as fierce time management, setting limits and boundaries with draining people, meditation to calm and center myself, and going out into nature. Being an empath is a gift in my life but I had to learn to take care of myself. Empaths have special needs. It's important to honor yours and communicate them to loved ones.